My failed attempt at being a foodie – The Small Things. There are two types of people in this world: people who have a natural instinct for cooking and people who do not. Sadly, I am the second type of person. I can’t cook. No, that is an understatement. I cannot do anything in the kitchen at all, I am useless. If I’m being kind to myself I would say I make a pretty mean bowl of stove popped popcorn… But that basically sums up my cooking abilities. So yesterday I was reading a post from one of my favs, Eating Bird Food by Brittany Mullins. This girl is adorable and she comes up with some fantastic healthy recipes. Once I made a roasted broccoli quinoa from a recipe that she posted and it was actually so delicious! Turns out I’m not completely useless if I follow instructions. 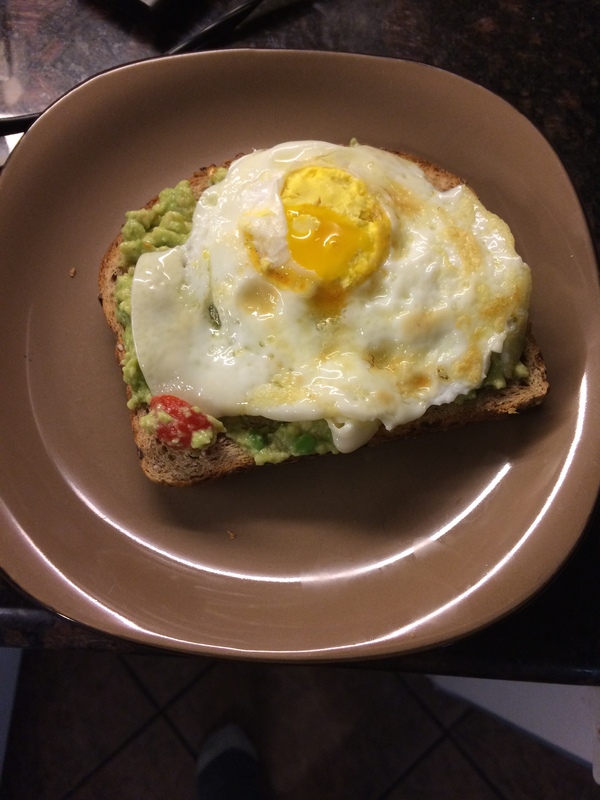 Anywhoo, Brittany recently posted a breakfast recipe for guacamole on toast with an egg and after reading it I just knew I had to try it! The guac recipe that Brittany posted called for frozen peas and some other fun things that I didn’t have at home so I decided to cut my losses and just make regular plain guacamole for my toast and egg. Oh my gosh! I have 20 minutes before I need to leave the house! I have time to make breakfast today. I should make the guac on toast with an egg thing! Alright google, how do you make guacamole?? Mash an avocado. Easy, okay. Sprinkle some salt, awesome I love salt. 1 table spoon of lime juice. oops… that’s more than 1 table spoon, whatever I’m sure its fine. Hot chiles, also minced. What is this mincing? Regardless, I don’t have hot chilies. Skip! Ground black peper. Finally, something I can add. Tomatoes. Pulp and seeds removed and chopped… I like the pulp and seeds so I’ll keep that stuff in. Chop chop. Wow that egg looks perfect, way to go alex. You rock, you kitchen goddess. Guac on toast, egg on top of that! mmmm here we go! You all know whats going to happen next. You read the title of this post. It was disgusting! Just horrid! Absolutely awful. Obviously my recipe variations did not translate into magnificent food, instead it was a slimy, bitter, salty mess. At this point I have 3 minutes to eat and get out the door, so I hastily scraped my guac into the garbage and ate my egg on plain toast. For the record the egg actually was perfect. Next time I promise to follow the recipe and I probably wont attempt to be creative in the kitchen at 7:00 am ever again. Have you ever had a foodie failure? Share in the comments! I’m a cooking failure too. like… all the time. I can do dishes like a pro tho!!! Ah see I can’t even do dishes very well! Take pride in that skill veryrach! When I wash dishes (which is a very rare occurrence) I always think the dishes are clean but then as they dry I realize I’ve missed a spot. I’m going to need to step up my game when I move into my own place at the end of the summer. Stay tuned for that disaster waiting to happen! LOL if I lived alone I would possibly starve to death. Make sure your place has a dishwasher!! Life is torture without one.